Something other than politics in Washington, D.C.
An artist I've admired since moving to Baltimore, quite a while ago, is Bill Schmidt. Bill, a multi-talented musician (playing the banjo, guitar, ukulele and fiddle) and a long-time teacher at the Maryland Institute and sculptor, has returned to painting, after a residency in Roche-en-Terre, France. The paintings in the exhibit at the Paperwork Gallery, Bill Schmidt: Outside of Time, are all gouache and colored pencil on paper along with several sculptural works. 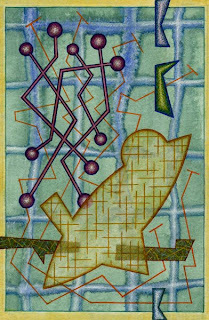 A bit of an homage to Paul Klee's organic shapes and color, Schmidt's small (7"x5" and under) works are infused with organic forms, but also radiating electronic-like signals and, for me, what feels like an internal world of the human body, with its complex vascular system, molecular structures, and pulsating organs, held in their virtual world by a base of colorful grids. This patient is doing quite well. The sculptures, for which Bill is most known, are either gently altered found objects, arranged on a shelf (pictured), or larger forms such as Pendule, made of stained wood and found objects, gracefully hanging from its perch. The shadow it casts creates a depth as seen in and around the shapes in the paintings. Bill Schmidt: Outside of Time is at Paperworks Gallery through May 2nd, and there are more images on my Flickr site. Thanks for the introduction to the multi-talented Mr. Schmidt. I particularly like that elegant painting. Your welcome bruce. I like his new work a lot. Ionarts is licensed under a Creative Commons Attribution-Noncommercial-No Derivative Works 3.0 License.